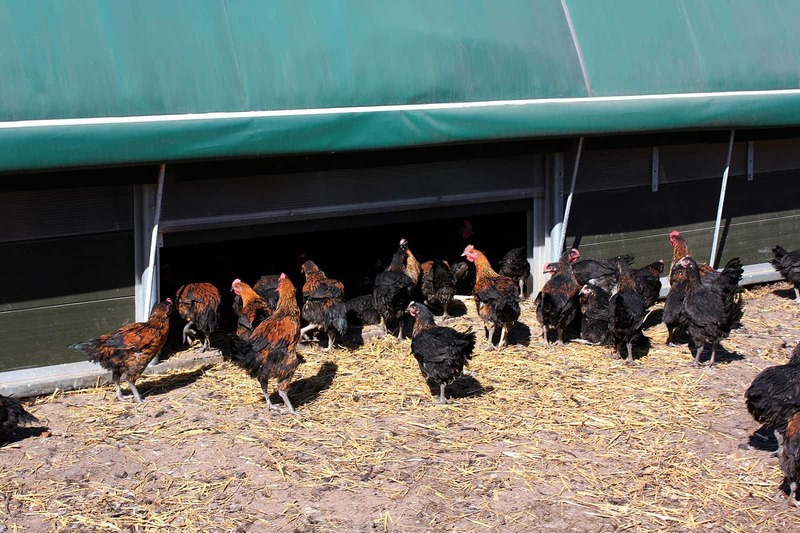 Providing the very best environment for free range or organic poultry rearing. The MPM6680 delivers the perfect balance between size, strength and manoeuvrability. 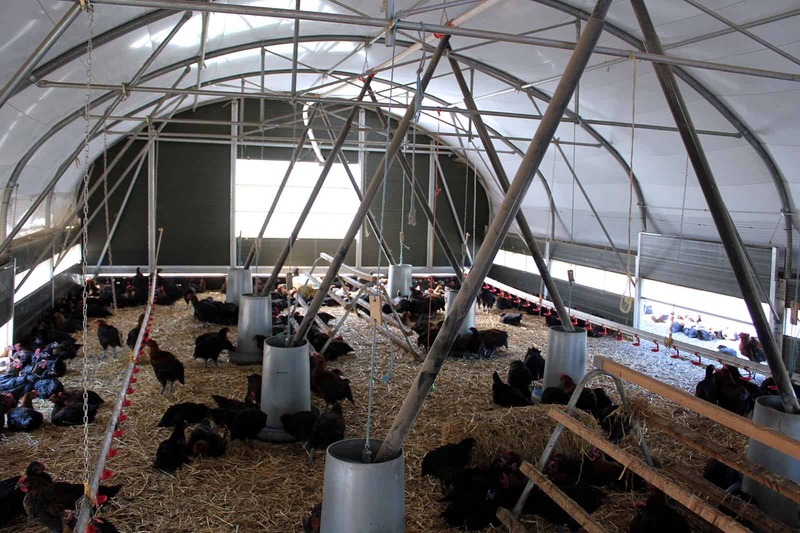 Simple operating systems along with adjustable ventilation, allowance of natural light and excellent insulation throughout creates a dynamic space that enables the highest quality rearing alongside great flock and site management. Housing 1600 to 2700 birds at a stocking density of 13 birds per m². The MPM6680 is fully mobile and can be easily towed to fresh pasture with minimum effort; all internal equipment is held clear of the ground making moving the structure simple and easy, with minimal preparation needed ahead of towing. Optimised design and material specification creates an environment that is easy to keep clean and disinfect. Highly resilient to bird waste and conducive to disease reduction; the heavy duty inner roof sheet and polymer side panels repel dirt and are easily cleaned with a pressure washer. An optional feed hopper support can be specified to extend from the front of the buildings structure. The hopper support is fixed to skids in-line with the skids running the length of the building. The support is formed of a trellis framework of galvanised steel with cross braces for the customer to fit their preferred hopper. This hopper support can support a hopper size of 2.5 tonne (net). Note: we do not supply the feed hopper – this should be supplied by the customer. 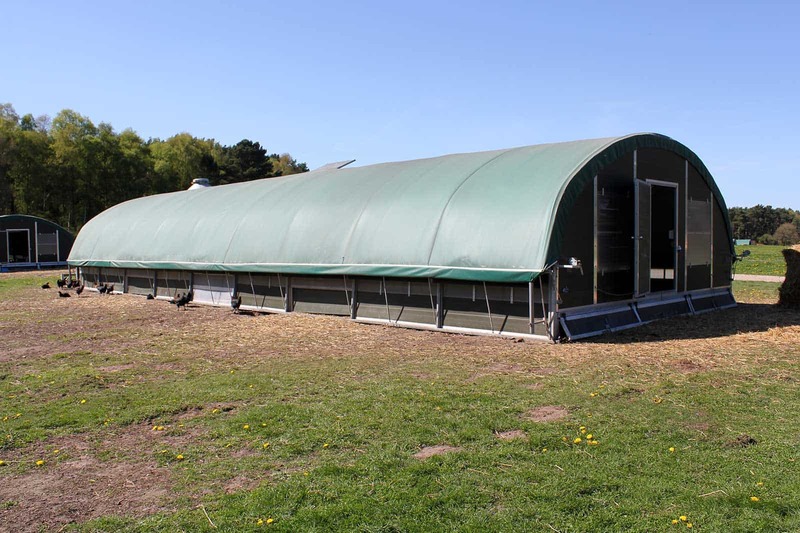 The MPM 6680 rearing house has a width of 6.68 metres and a ridge height of 3.25 metres. Its modular construction allows the building length to be specified to meet the requirements of each site and flock; expanded by multiples of the structures 2.10 metre framework spacing. The building’s structure is manufactured from 60mm (section), 1.5mm thick, Z35 hot-dip galvanized steel tube providing superior structural integrity along with a lasting and high-quality finish. Cross bracing is fitted at every bay creating a robust structure, ensuring stability when mobile and during adverse weather conditions. The building’s roof is a 3-ply construction, comprising of a resilient 600gm PVC inner and outer sheet, sandwiching a sleeved 80mm Earthwool FactoryClad insulation. Side and gable end walls are constructed from extruded HDPE olive green interlocking polyboard panels providing excellent strength and insulation. Polycarbonate window panels run the length of the building, along both side walls. Polycarbonate panels are 250mm high and allow a measured amount of diffused natural light into the building; in-line with freedom foods recommendations. Ventilation is provided by baffled side vents running the length of the building with a manually operated ridge vent drawing air through the internal space and exhausting ‘dirty’ air. Manually operated pop-holes are evenly distributed across both sides of the building with a provision of 600 chickens per pop-hole, giving controlled access to the range. Personnel access is provided by a single door at the front and rear of the building. The building is fully mobile and can easily be towed between laying cycles with minimum effort. Constructed with two galvanised skids that run the length of the structure. Supplied with a detachable tow bar for towing from either end. Sold and dispatched with a full installation manual, this building can be self-installed by a capable team, however, we recommend customers consider using a dedicated installer for their building. This building is packed and dispatched as a palletised kit and can be distributed worldwide.